We have seen that temperature is a measure of the thermal energy of the particles in matter. More specifically, temperature is a measure of the kinetic energy of the particles’ random thermal motion. An electron has only 1/1840th the mass (approximately) of a proton, so electrons will have much higher velocities than ions at the same temperature. This is because kinetic energy is proportional to the mass of the particle and the square of its velocity, K.E. = 1/2 mv². Therefore, at the same temperature, the ratio of velocities will be inversely proportional to the square root of the particle masses. For example, average electron velocity will be around 43 (i.e., √1840) times higher than the velocity of a single proton. If the positive ions in the plasma are heavier than a single proton then the difference will increase accordingly. What is more, because of the Principle of Conservation of Momentum, an electron will tend to undergo a larger change in its velocity than an ion does in a collision between the two particles. The electrons’ higher velocity results in more rapid interactions, which means that the electrons reach thermodynamic equilibrium (“the same temperature”) amongst themselves much faster than the ions do. Any increase in velocity, whether from collisions or external energy inputs, is therefore ‘shared out’ amongst the electrons very rapidly. For these reasons, it is common for the electron temperature in a plasma to be different from the ion temperature. Often the electron temperature will be higher than the ion or the ambient temperatures. This is especially common in weakly ionized plasmas, where the ions are often near the ambient temperature while the faster-moving electrons have high temperatures. Wikipedia reference on plasma temperature here. In a plasma the temperature is often expressed as a thermal potential which is equal to the potential drop (change in voltage) through which the particles would have to fall in order to gain the same amount of energy. The kinetic energy can then be expressed in electron-volts or eV. The hotter the plasma, the faster the electrons and ions are moving in random thermal motion and the higher their potential. A potential of 1 eV is equivalent to a temperature of 11,604.5 K. Particles with potentials many orders of magnitude higher are common in space. Note: one must be cautious about the conversion between electron volts and thermal temperatures in plasma. Plasmas can become ordered so that charged particles follow paths that are aligned with the local direction of the accompanying magnetic field. Such current flows are termed field-aligned currents. Under this condition, charged particles are moving approximately parallel to one another, and, partly due to the low density of particles, collisions of the thermal variety can become very rare. The high temperature alleged for the solar corona is based on spectroscopic observations of the light (electromagnetic radiation including frequencies outside visible light) which indicate how much ionization of atoms has occurred. The ionization energy in eV is inferred from the wavelengths of light emitted, and converted by the formula above to equivalent temperature. The thermal aspect of temperature which is caused by large numbers of random collisions is not necessarily present, however, even if there has been sufficient energy input to strip electrons away from their nuclei. The electrons can be fast (energetic) while their (thermal) collision rates are low. The high velocity of the electrons is especially important in understanding many aspects of plasma behavior, including radio galaxies, galactic and stellar jets, and production of synchrotron radiation and cosmic rays. If plasma is contained within a laboratory tube or other vessel, the electrons and ions in the plasma will impact the walls of the vessel with a frequency proportional to their velocity. On impact, particles are absorbed by the walls. As the electrons have much higher velocities than the ions, the rate of electron impact will be many times that of the ion impacts. As a result, the walls of the vessel will acquire a negative charge. As the negative charge on a surface develops, arriving electrons will tend to be repelled from the surface. Only those electrons with sufficient velocity to overcome the repulsion will still be able to impact the surface. The negative charge on the surface will continue to increase until the number of electrons hitting the surface equals the number of positive ions arriving. 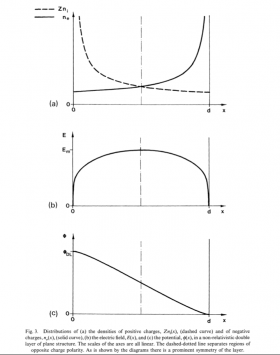 The plasma and the surface will have achieved a balance, or steady state. In the steady state, only the fastest electrons will still be able to get through the adverse potential gradient from the negative surface. Most electrons will be prevented from approaching the surface. This results in a layer of plasma adjacent to the surface in which the ions outnumber the electrons. This positive layer is known as a Debye Sheath. Similar effects are found if the surface is charged negatively or positively by connecting a source of potential such as a battery. The charge on the surface repels like charges in the plasma, leaving behind an oppositely-charged sheath. A surface sheath does not have a definite physical boundary but may be considered to end where the potential resulting from the negative surface and the positive sheath acting together balances the potential of the plasma itself. In other words, the sheath boundary is where the potential is just sufficient to repel electrons with energy equal to the plasma potential. For example, if the plasma potential is +1V then the nominal boundary will have a potential of -1V. The explanation is as follows: The boundary has a negative potential because the sheath must repel approaching electrons. The electrons in the plasma have a kinetic energy of 1eV. Therefore, the sheath needs -1V potential to stop the approaching electrons from reaching the surface. This is analogous to rolling a ball up a hill. If the ball has enough kinetic energy then it will reach the top. If not, it will get a part of the way up before coming to a stop and then rolling down again. The sheath potential is analogous to the height of the hill. It can be seen that the sheath does not have a ‘hard’ edge and in fact the potential field arising from the negative surface continues past the sheath ‘boundary’. Nevertheless, the boundary may be taken as the point at which the negative surface is effectively ‘neutralized’ by the sheath because electrons with the plasma potential are ‘reflected’ back into the plasma at that point. American chemist and Nobel laureate Irving Langmuir developed measurement methods and observations of plasma actions. 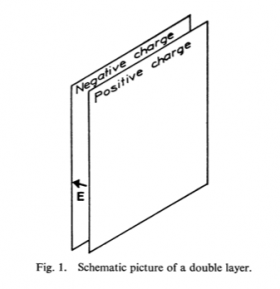 An interesting and useful PDF lecture, Plasma, Sheaths and Surfaces — The Discharge Science of Irving Langmuir, can be found here. Similar sheaths will form around any charged body in a plasma where the body has a different potential from the plasma itself. The plasma effectively isolates the foreign body by forming a sheath round it. The sheath will tend to screen out the electrostatic field from the alien charge in the same way that a sheath tends to isolate a negatively charged surface. The body eventually may be neutralized by opposite charges that it absorbs. If the charged body can artificially be given a positive or negative charge by connecting it to an external source such as a battery, ions or electrons, depending on the charge, will be attracted to the body and so a current will flow. By careful measurement of the current for a range of voltages, it is possible to measure the potential of the plasma itself. One such device is named a Langmuir Probe after Irving Langmuir, 1881–1957. 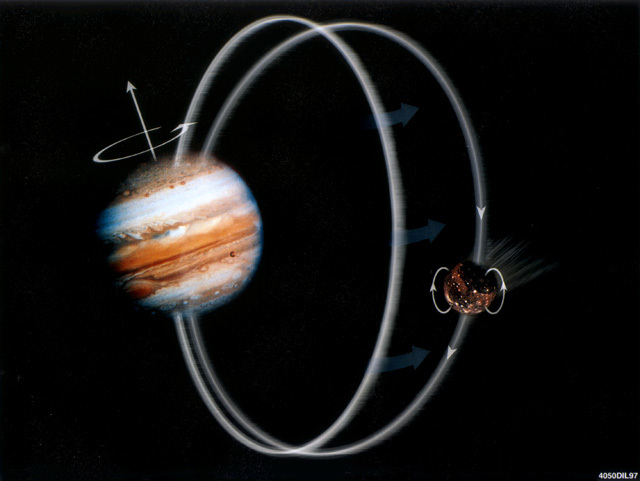 Current flow from the solar wind can be observed at planets with magnetic fields which have polar “cusps” or “holes” that guide charged particles down to and through the body, creating auroral displays in the upper atmosphere. 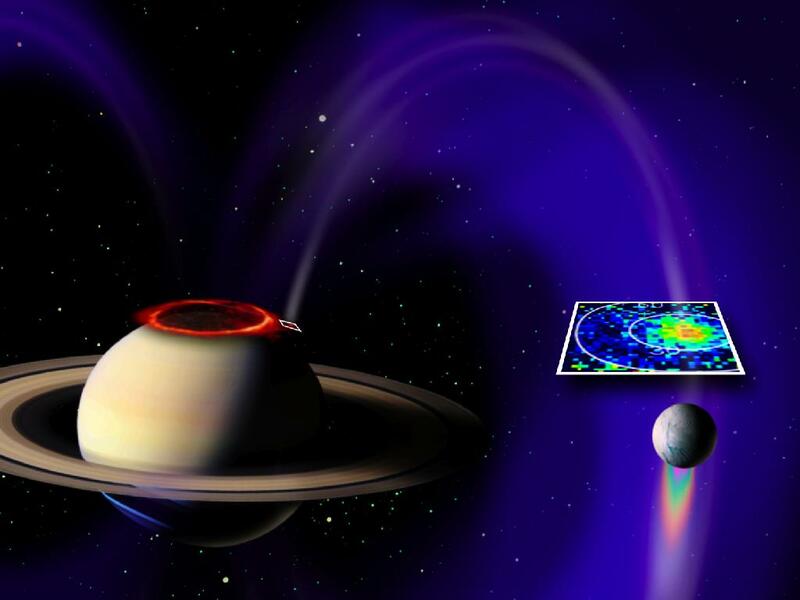 At smaller scales, some planetary moons move in plasma-filled orbits, with charged particle flows directed from the moons’ polar regions along magnetic field lines to and from “hotspots” in the auroral ovals of the larger planet. Examples include Ganymede, Europa and Io at Jupiter, Enceladus at Saturn, and possibly Uranus and Neptune as well. 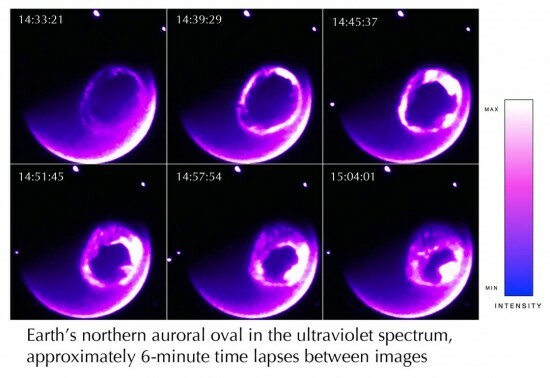 Similar effects also occur between two adjacent regions of plasma with different characteristics. For example, the two regions may have different temperatures, densities, or degrees of ionization. In this situation, the different velocity distributions in the two regions will set up a double sheath at the boundary whereby each region effectively insulates itself from the other. Importance of the reference above: This is the reason that conventional hydrodynamic and magnetohydrodynamic equations of fluid flow are inadequate to a full and reasonably accurate mathematical description of plasma dynamics. Consequently the computational method called particle-in-cell (PIC) simulation was developed for plasma modeling in massively parallel computer systems in the 1980s. Here is a Wikipedia article on PIC, and here is a more technical paper on the subject. We have seen that CFDLs form between regions of plasma with different characteristics. As an example, let us consider the effect of a temperature difference (in electron volts, ref. 5.1 above). This causes an electric field to build up, which will accelerate electrons back to the hotter region. A net flow of electrons to the cold region will continue to build up the electric field until a balance is achieved between the numbers of hotter electrons moving to the cool region and the number of electrons being accelerated back to the hot region by the electric field. The thin regions near the boundary containing an excess of ions or electrons constitute a Double Layer at the boundary which has an electric field and associated potential drop across it. The formation of sheaths at boundaries between different plasma regions creates cells of plasma. This cellularization is a defining characteristic of plasma behavior. 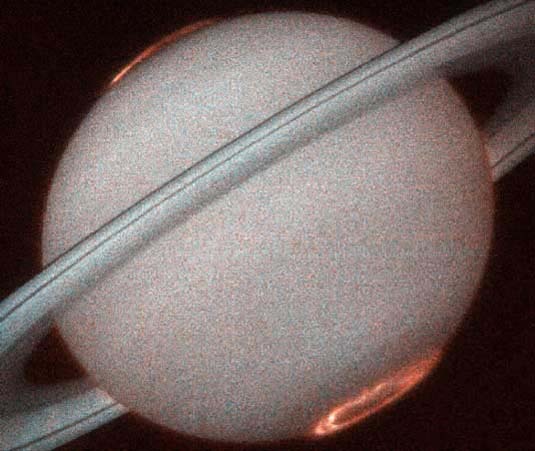 Gases do not behave in this fashion, which is one reason why it is not possible to apply gas laws to plasmas. At first sight, a Double Layer (DL) appears to be something like a shock wave in fluid dynamics. Indeed, a DL does share some characteristics of a shock wave in that it separates regions of differing characteristics and acts to accelerate the medium. In the case of DLs, however, the acceleration occurs as a result of the strong electric field set up between the oppositely charged layers. As the force from the electric field depends on the charge on the particle, ions and electrons are accelerated in opposite directions. Neutral particles are not accelerated at all by the electric field, but may be entrained through viscous or other effects. 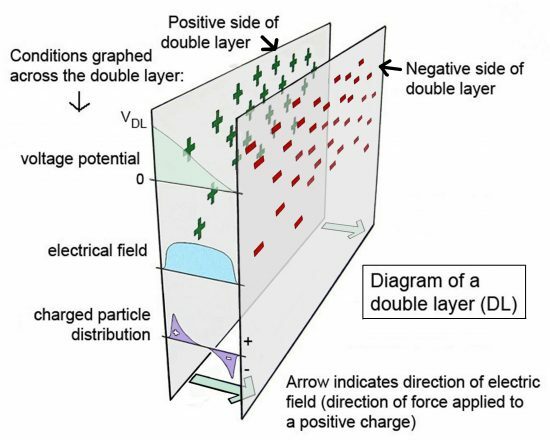 Note that the formation of Double Layers cannot be effectively modeled by fluid analyses such as magneto-hydrodynamics (MHD) because it is caused by and is dependent on motions of different individual particles, not on the bulk motion of the plasma. Double layers are one of the most important aspects of the self-organizing characteristics of cosmic plasma, as we will see.